DEAR MARY BETH: Wood stair treads really take a beating in many houses. It’s a combination of things that put them at great risk for damage. For one, the typical motion of a foot is to slightly slide across the tread as you plant it on each tread as you climb stairs. That scuffing action, in the presence of any dirt or grit, can rapidly wear any finish on the treads. Treads can crack if a concentrated load is placed on a single stair tread. This can happen if, for example, a cast-iron tub is carried up a flight of steps, but is set down as the workers rest and reset their grip. You might be able to make all the repairs to the treads and bring them back to prime condition with a concentrated work effort. I would absolutely try to do this since you do have a fallback position with the rug stair treads. 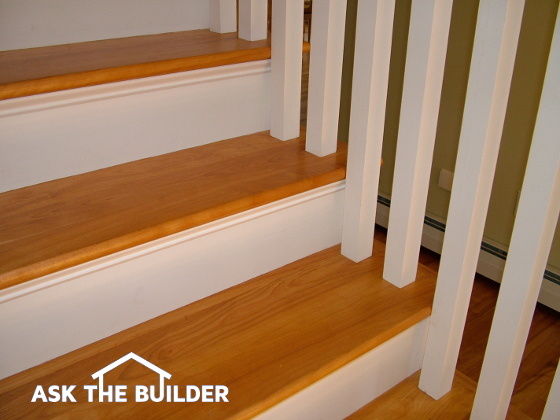 Hardwood stair treads are primarily finished by hand. You may be able to use a belt sander on a wide portion of the flat tread, but you must be very careful not to sand too much wood. This will cause you tremendous frustration as you then try to blend in the edges next to the stair risers and the side stringers. Professional floor refinishers have scraping tools they use to pull off the old finish and take the wood down to a satin-smooth finish. I highly recommend getting one of these scraping tools. Don’t cut any corners as you try to refinish the wood. To get professional results, you must have the wood nearly as smooth as glass before you stain it or put on the first coat of finish in case you want the natural look. All dust must be removed with a tack cloth, rags damp with mineral spirits, or use of a vacuum that exhausts outdoors. Staining oak is not difficult, but you need to wipe off excess stain to prevent a blotchy appearance. The finished color of the stair treads will look exactly what the treads look like as you apply the stain and immediately wipe it off. As the stain dries, it will dull and get somewhat lighter. It will darken when you apply the first coat of clear finish. I would apply no less than three coats of finish to the stair treads. You should lightly sand the treads in between each coat of finish. You do have a unique option where you can blend carpet with the oak treads. In my home, I have a stair runner carpet that goes up the center of the stair treads. There is about 6 inches of oak tread exposed on either side of the carpet runner. My wife selected an Oriental style runner that really looks superb, but there are an almost unlimited number of carpets that you can use for runners. If you do this, you can shortcut your refinishing efforts by only working on that part of the tread that’s visible. Repairing the cracked stair tread may not be too hard if you can inject the crack with an expanding urethane glue or a heavy-bodied epoxy that’s formulated to bond to wood. If you carefully place the glue so that the top of the crack is left open for some wood filler, the crack can disappear once you stain and add urethane to the tread. The key is to carefully place the glue or epoxy so that you don’t get any on the wood adjacent to the crack. If you do decide to use stair tread carpet, it’s really important that you have a professional install it. I would visit one or two specialty carpet stores and talk with the store managers about who they have that’s an expert in stair carpet. The carpet on steps can’t budge. It must be tightly wrapped and fixed to the treads so that it never detaches causing you or someone else to slip and fall. If you decide to use the carpet runners, take a few minutes to look at the decorative trim you can use to add sizzle to your stairs. There are all sorts of stair rods that are placed at the base of each stair riser. These decorative brass and chrome rods are not functional with modern installation techniques, however years ago they held stair carpet in position. This hardware is installed after the carpet is in place. Only a few simple tools are required, those being a hacksaw, drill and screwdriver. The rods come in different styles so be sure to look at a good variety before you make your final purchasing decision. To keep stair treads looking great, be sure to vacuum them regularly. Sand and grit can easily accumulate on stair treads because the soles of shoes bend as you go up and down stairs. If you walk on and slide your shoes on the sand and grit, you’ll ruin all that hard work you invested. This is one reason outdoor shoes are left at the door in my NH home. It’s easy to keep floors and stairs looking great if you just wear slippers indoors.